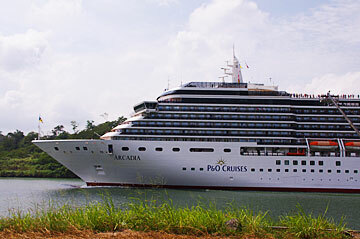 The MS Arcadia is a British cruise liner, the second largest in the P&O Cruises fleet. She was built by the Fincantieri company of Italy in a period of just twenty months. She was launched in April 2005 and named by Dame Kelly Holmes. 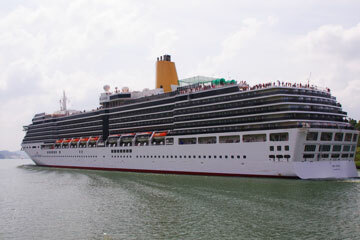 An earlier ship of the same name is now operating as the Ocean Village. Stylish in design and atmosphere, child-free Arcadia offers a classic cruising experience. With many innovative signature features, she offers an experience that is quite unique. A three tier theatre. A fine dining restaurant, which spans two decks. And a luxurious spa, complete with thermal suite and hydrotherapy pool. 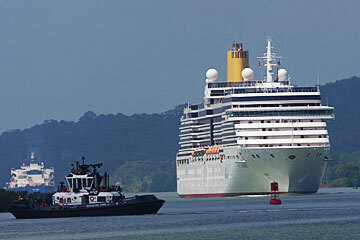 The MS Arcadia is shown here in the attached images on her South Bound Panama Canal transit on January 24th 2010 near the Gamboa area.